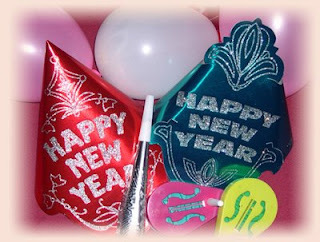 Come on all my blogging buds, let's gather around and sing: Happy New Year and Auld Lang Syne. We all sing Auld Lang Syne on New Year's Eve but what does it mean? It's an old Scotch phrase that means "Old Long Since" but would be more appropriately translated today to "Long, long, ago". Some say Rabbie Burns wrote the poem but some say he only added to the already existing poem. If you're interested in reading the poem, and a Gaelic translation, click on Rabbie Burns' name. One of our favorite Christmas dishes is an old Danish family tradition that has been kept a secret for generations. But I'm willing to share it with my blogging buddies. It is called Brune Kartofler. Brune = Brown and Kartofler = potoatoes. If you visit the All Time Cookbook website, you can see a picture of the finished product and I can testify that they are YUMMMMMYYY! These brown potatoes are not a dessert even though they are really caramelized potatoes. Take four cans (14 oz cans) of baby white potatoes, drain the liquid and let them stand. In a cast iron pan (preferably a dutch oven) pour in two cups of white sugar. Heat on low-heat until the sugar turns to a brown liquid. Stir in one cube of butter. Then carefully place the potatoes in the caramel and let heat on low heat for 30 minutes. WARNINGS: (Be extra careful with the caramel - it can pop when you place the potatoes in the liquid and it will burn) I add the potatoes with a long metal spoon to keep my hands back away from any splattering caramel. Don't over cook the caramel because it will turn bitter and taste burnt. These aren't easy to make just right but they are a special treat. I made these potatoes for Thanksgiving and the kids said they tasted a little burnt so on Christmas I didn't cook them as long and the kids said they didn't have as rich a flavor as they usually do. I explained it was because we'd gone to the movies to see Bedtime Stories, starring Adam Sandler, and I didn't want to rush the potatoes. So I cooked them slowly but didn't have enough time to get them as thoroughly coated as usual. However, my friend Jacqueline - who had never had them before - said she loved them. So, I guess it's what your used to. My kids just expect perfection - unfortunately parents aren't perfect. :) I told my daughter that "parents aren't perfect" and she said, "They should be. But, you can work on it." 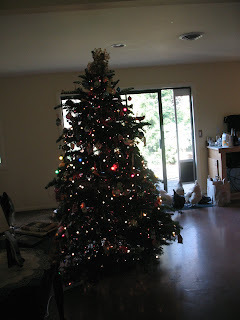 I always feel a little sad when Christmas is over and I have to take down the decorations. Here's one way to turn that blue feeling to green, with a little help from Earth 911 and Lori Brown. It can be easy to treecycle. And, real v. fake can be a good thing. I love to garden. So, making mulch is one easy way to go green. 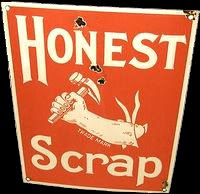 But you can look up recycling centers in your area that will do the job for you. There's no better way to celebrate the holiday than sitting with loved ones and watching James Stewart, Donna Reed and Lionel Barrymore in my favorite movie: It's a Wonderful Life. The show paints an amazing picture. One life can touch so many, without even trying. George Bailey doesn't want to stay in the small town of Bedford Falls but the impact he makes is breathtaking and he doesn't even realize what he's doing. 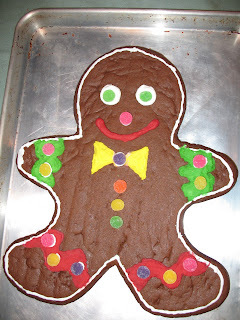 The other thing about spending time with family and friends (including our furry friends) is making memories that will last a lifetime, like this giant Gingerbread Man - made by MacKenzie - he's one guest we won't soon forget and neither will our waistlines - YUMMMM! 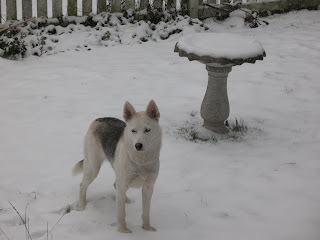 I finally got a good photo of Sasha in the snow. She loved it. 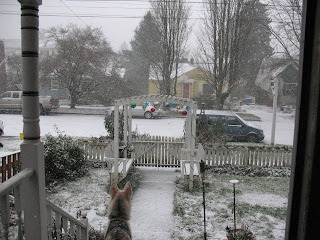 The Holidays have a way of sneaking up on us - and we got hit with the storm of the century! We have about a foot of snow and are expecting another foot. I still had shopping to do. 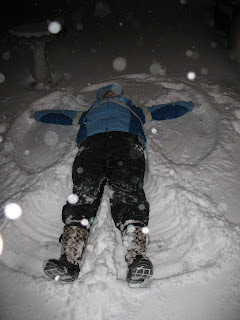 . . oh well, instead, I went outside to work out some of my frustration - by making snow angels. It's so beautiful. 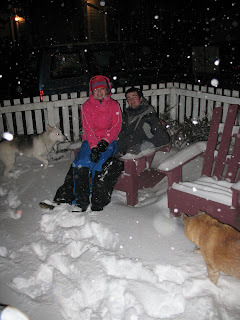 The snow is falling, the wind is whistling and we are all together! 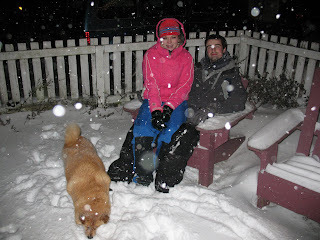 We went up to Gilham Hill, which was closed to traffic because of the storm and went sledding. 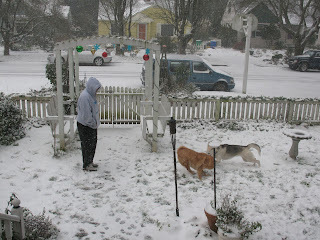 The dogs loved playing in the snow and when we got home Luke and MacKenzie relaxed out in the yard for a bit. 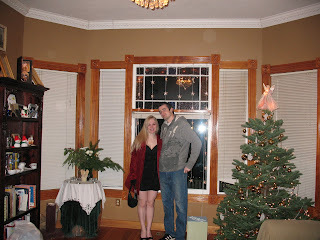 MacKenzie and Luke went out for a fancy Christmas dinner. Well, not tooo fancy, because - as you can see - Luke didn't get tooo dressed up. I took this picture. Look at all the strange orbs in it. They weren't in all the photos. Maybe they are just dust balls on the lens. What do you think? 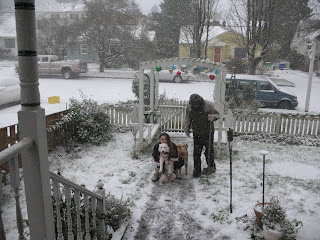 Here, in Portland, Oregon, we've been hit by the snowstorm of the century. Well, ... at least the storm of my lifetime. So we've been home bound - sort of. MacKenzie joined in with the family and she fit right in. My husband and I took the dogs for a walk and we were looking at all the beautiful lights, some how we started talking about the Menorah and Hanukkah. Then the Festival of Lights and Kwanzaa. I think it’s interesting that so many different faiths celebrate around the same time of the year. I don’t know why that is, but I’m curious. I thought I’d look into it a little bit. I have a couple Hindu friends, Aghila and Usha, and some Jewish friends, Pam and Merrill. I’m going to ask them a bit about the different celebrations and see what the similarities are. But if you know, please add a comment. Answer to Thought for Thursday: You gals guessed it: Gold, Frankincense and Myrhh. These were all expensive and rare commodities during those times, and they were used to honor the recipient. If you want to learn more about this topic, you can read a detailed breakdown to the Thought for Thursday answer here. Read about organic baby wear here. 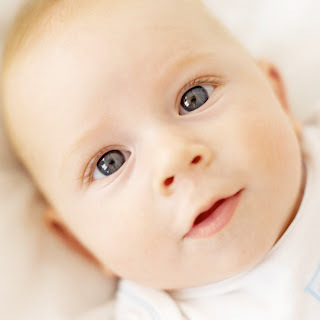 Babies are so perfect and pure, who wouldn't want to put the very best on their delicate skin? 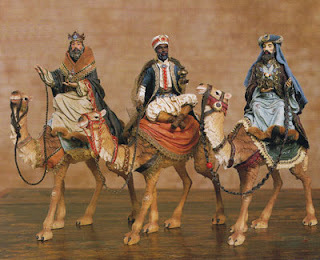 QUESTION: What gifts did the Three Kings Bring to the Baby Jesus? KICKER QUESTION: Do you know what the gifts represented? Brother and Sister Team: Jennifer Holm and Matt Holm collaborate on Baby Mouse. I guess you have to be logged into FACEBOOK to be able to view the movie - SORRY! But the graphic novel, Baby Mouse, is aimed at kids ages 7-10. You have to click on the screen and then click on the carrot to start the show. Shelby did an analysis of my handwriting. 1. The ascending baseline suggests the writer is more of an optimist than a pessimist. 2. The tangled lines suggest the writer always has a lot to do, is generally not a planner, and prefers to live in the moment, driven by impulse and emotion. 3. The reversed strokes point toward possible inner conflict or some minor personal guilt being carried. 4. The moderately wide loops in the lower zone indicate the writer is ambitious and productive at tasks. 5. The narrow, retraced loops in the upper zone suggest a writer who may be stuck on old patterns and ways of thinking with less interest in exploring new, modern concepts. 6. The ascending signature implies that the writer is ambitious and hopeful. The connectedness of the letters indicates that, socially, the writer likely makes friends easily and enjoys close relationships with others. The speed of the writing combined with a lack of end strokes (#7) points toward impatience; the writer dislikes wasting time. This seems to coincide with the aforementioned traits of preferring to be busy and engaged in some meaningful activity. The addition of ornamentation (a colon, dashes, and capital letters) indicates that the writer is likely to have a home filled with art and sculptures, with an emphasis on creative design. The writer seeks beauty in all things. The individual is dramatic and knows how to make an entrance at a party. 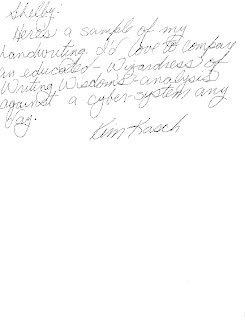 Overall, the handwriting sample suggests an imaginative and outgoing individual who makes friends easily. The writer may lead a rather fast-paced lifestyle, either now or has done so in the past. The addition of ornamentation, such as the colon, dashes, and capital letters, shows an abundance of ideas and pursuits, and may also indicate the writer is prone to exaggeration and flair. The moderately spaced words reflect a genuine warmth and affection for others. With so much compassion and drive, this individual would make an excellent business partner and friend. Also attached is a diagram to reference the numbered points above. Thank you again, and I hope you enjoyed your analysis. I loved getting this analysis. I think this sort of thing is fascinating - maybe that's why I got my degree in psychology ;-) either that or I wanted to understand the crazy way my mind works. And she got right into the sport of playing in the snow - like any kid would do. 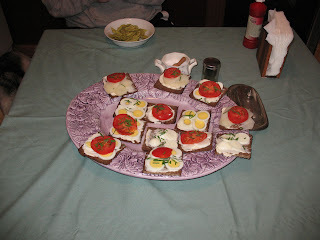 Then we all went inside and had Danish smorgasboard - or open-faced sandwiches for lunch. I got up early because I had so many things I wanted to do today. 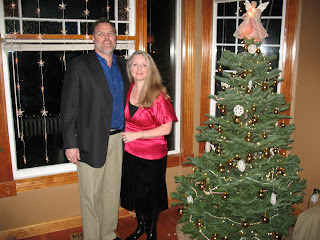 Then we went to my office Christmas Party. 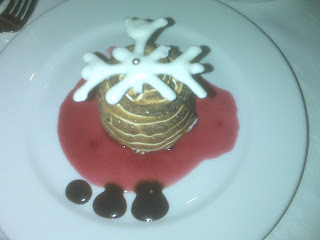 It was a beautiful setting and beautiful food. And boy-oh-boy was it amazing. I'd never had it before. And, I was only going to take a bite to taste it - until . . . 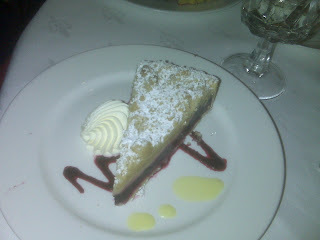 I tasted it and fell in love. We had a nice time but then after dinner, when the party went into full swing, I was ready to come home, put on my pajamas and do a little reading and writing. My husband enjoys the partying but I guess I've always been more of a "homebody". 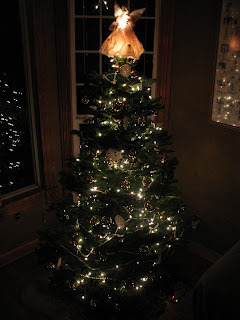 I like to sit and look at my Christmas tree and know that my kids are here. I enjoy being home - always have. How about you? Party or pajamas? Here are a couple examples of the scarves I've made. One is red velvet and green satin, very simple. 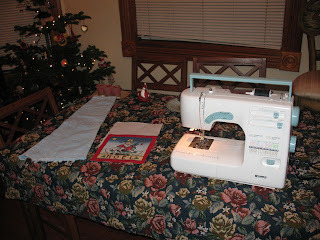 If you can sew a straight line, wah-lah you've got a gift you'll be proud to give. And, if you can knit, there's nothing easier than a scarf. I'm always making scarves. I give the best ones away. Here are a couple other crafts I've made. 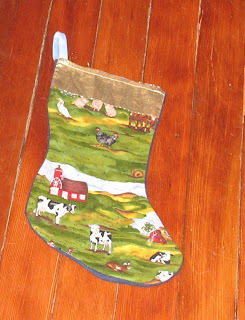 I made my son this farm animal stocking when he was about five years old. He still likes it. I also take old jeans that I've outgrown :( and use them as padding for hot pads and pot holders. I also take soft cotton fabric and make kitchen towels, which I wrap Christmas presents in at the holidays. Just a few EZ ideas. ANSWER: According to Wikipedia: It is forbidden to make a Menorah like the one in the temple, due to the sanctity of the temple. EARTH-FRIENDLY FRIDAY: Bella Sister's is a design line of clothing that uses recycled clothing. Visit this photographer's site, Five Petal Design, and see some of the pictures of the cool re-fashioned jackets and blazers made out of worn-out or damaged clothing. What a cool way to be green. And, if you're looking for a home-remedy for cold and flu season, check out the cold sock treatment here. 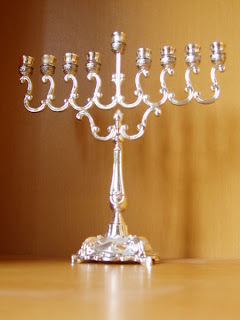 QUESTION: The Menorah's center candle is used to light all the other candles but why is the Menorah eight armed for Hanakkah, as opposed to seven armed as the traditional style of the Menorah in the temple? I love this guy's voice and his "Mario" mustache is hilarious. 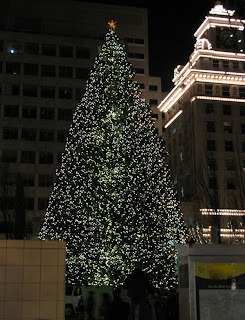 This is the Pioneer Place Christmas Tree. 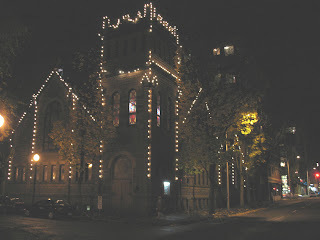 A church in downtown Portland. 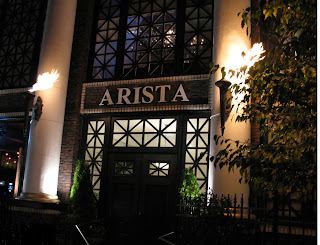 This building on 39th and Hawthorne has actual flames shooting up out of the sconces on either side of the front door of Arista. Creepy but cool, in a hot way. 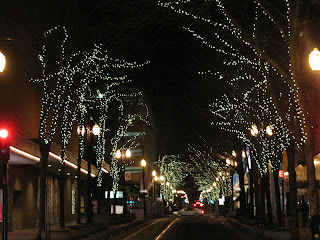 Everything seems prettier during the holiday season. We spent the day visiting family: we went to my brother's house and then my uncle's house. 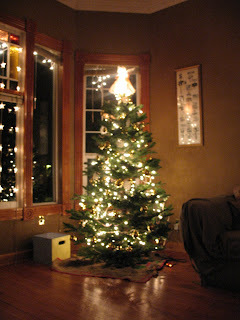 After that we decorated our trees and I baked a bunch of cookies to take to the neighbors. It's Luke and Kara's finals week. Good Luck!!! I spent the day at a Christmas Cookie Exchange/Party. 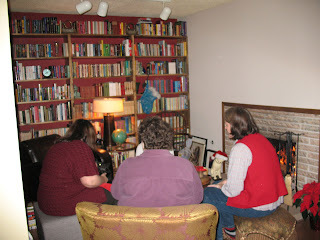 We met at Diane’s house, decorated her tree, enjoyed a potluck lunch, and sat by the fire for a chat. 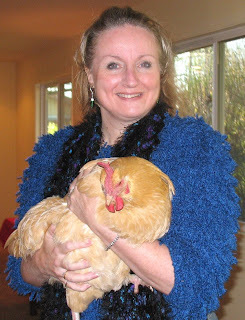 We all had our picture taken with Meg, the Christmas Chicken. (BTW: Meg is a pet, not going to be a meal - just thought I should clarify that point). When the party was over, we all headed home with four dozen cookies. What a sweet party. Diane has a cool library too, check out one wall of books, but there are three walls like this - all stuffed with great books to read. 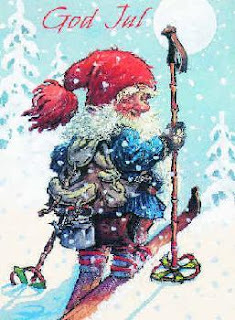 ANSWER TO THOUGHT FOR THURSDAY: A Nisse is a little gnome-like creature. Read more about it here. At Christmas, these elf-like creatures help Kris Kringle but in Norwegian folklore one actually became Santa Claus. God Jul is Merry Christmas. Okay, I want to set a green holiday scene but this is the one time of the year I splurge a little – at least when it comes to lights. I can’t help it. 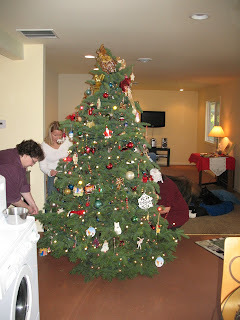 I love the holidays – always have. The rest of the year I am so watt-wise. But don’t worry, there are other ways we can go green without looking like we’ve turned into the Grinch who Stole Christmas. Here are a few tips that I’ve been using for years. 1) Collect flower seeds all summer and then dry them in the basement or another cool dry place, package them in pretty envelopes, and make hand-printed labels to give the Seeds of Friendship. 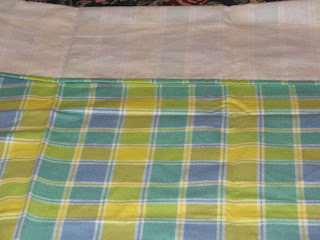 2) I use old fabrics and cut them down and sew them into dishtowels, then I wrap my gifts in this recycled fabric. It’s easy to add ribbons and/or other embellishments to make them picture perfect. 3) Mix up your favorite cookie dough or hot spiced drink and then package it in a clean, glass container to give to a hurried mom. You can add a nice cookie sheet or mug to make the present even more practical. 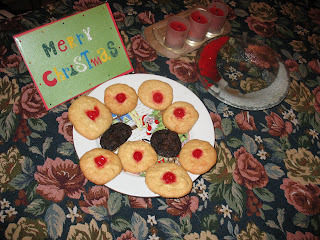 It’s easy to have home-baked cookies when the batters already mixed up and waiting in the refrigerator. Or, how about a nice cup of spiced cocoa? Just add some peppermint shavings to create a peppermint cocoa mix. 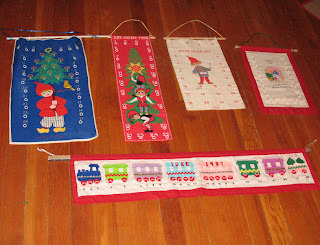 4) I also save scrap fabrics and sew them into beautiful Christmas scarves. If you don’t have scrap material sitting around, buy a yard or two of pretty fabric and you can sew plenty of projects for co-workers, friends or family. 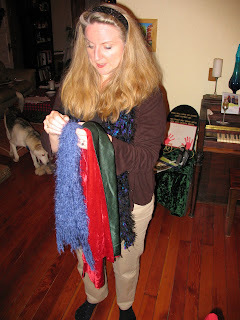 5) If you can’t sew, you can buy a nice fleece material and merely cut the edges to make it into a pretty scarf. 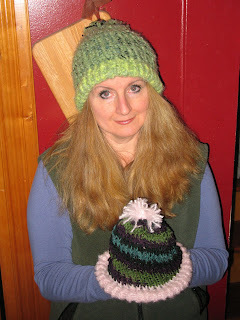 6) There are also plenty of free-patterns on-line. Print out an easy knitting project, buy a pair of knitting needles and a ball of yarn to give to a young lady on your list. Knitting is cool again, so is crocheting. These are inexpensive presents that will stretch your budget and keep packaging to a minimum. Plus the result will be something useful, like a scarf, sweater, or hat. Okay, Kelly Polark has shared this fun link and I thought I would too. Of course there are some free writing analysis sites on the web, but who wouldn't want a more personalized approach? 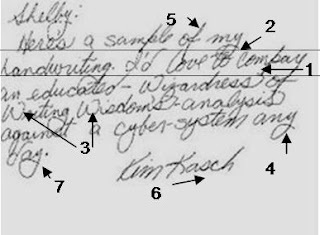 If you're interested in having your handwriting analyzed check out Shelby's blogsite here. QUESTIONS: What is a Nisse? We were singing Christmas Carols, and one line from Silent Night caught my attention: "Round yon virgin mother and child." I remember wondering as a kid, what is YON? It can also be a pronoun, "that or those yonder." 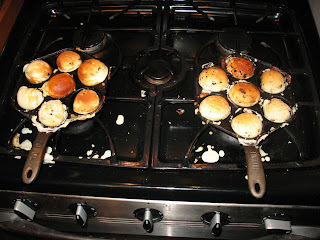 One of the ways we celebrate any holiday is by beginning the morning with Ǽbleskiver. 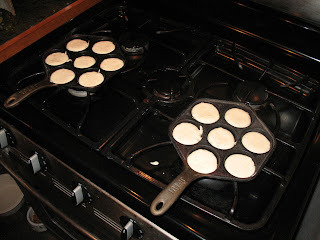 These are round-ball pancakes. We dip ours in jam and then powdered sugar. It is a special breakfast, we only eat a few times a year. You need these special Danish cast iron pans to make them correctly. If you want to see the recipe, click here. Then on December 1st, we pull out the Advent Calendars. 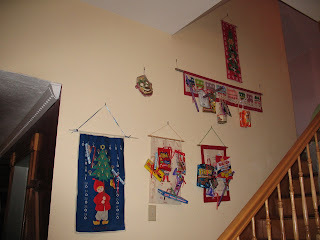 During the 24 days of Christmas there is a small present hanging on each day of the calendar. Here are our family calendars. The Danes celebrate Christmas on Christmas Eve, December 24th rather than Christmas Day. 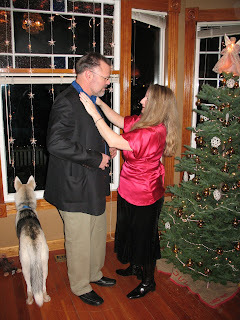 This always worked out well for us because we celebrate Christmas with my husband’s family on Christmas Eve and we celebrate with my family on Christmas Day. 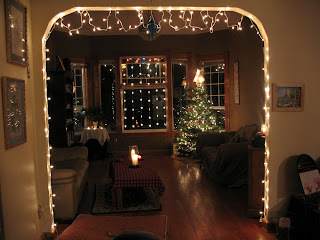 Do you have any special ways you celebrate the holidays?